one problem and two different ways to face it. A tale of two towns. Well, one is a city and the other is a village. I keep promising myself I won’t bother with this kind of post, and here I am again. Sometimes, some things can’t be avoided. A council is planning to spend £2.5million on a traveller site for just 13 caravans - which will cost as much as the average first time buyer spends to get on the property ladder. Bath and North East Somerset Council will spend £190,000 ( $ 317,092.92 ) on each pitch on the green belt site while neighbouring properties sell for just £160,000. Opposition councillors have slammed the project and insisted it would be cheaper to buy properties for gypsies to live in. However .... in another place with another group, a village decides to take the vermin on and not accommodate and appease. A group of gypsies who used human rights laws to stay in their illegal camp for more than four years have finally been told to move on - leaving taxpayers with a legal bill of £200,000. 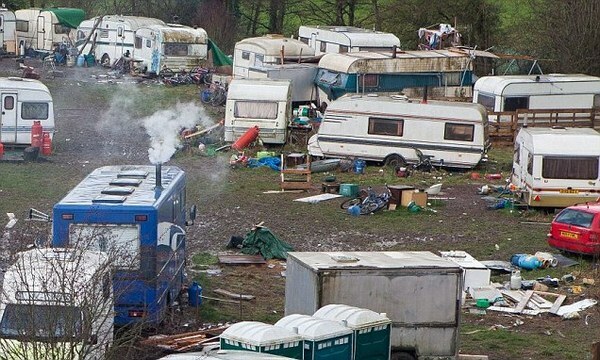 The 78 Irish travellers, who hail from just four families, had refused to budge despite facing three different courts, a planning inquiry, a council, and a battle by locals who accused the group of trashing their village. Last October the camp in Hardhorn, Lancashire, who had flouted planning rules, appeared to have lost its case when they were told to move out by the Court of Appeal. However, despite being given four months to quit the site without the chance to appeal, the group used a loophole to take their case to the Supreme Court claiming the eviction ‘violated’ the human rights of the 39 children living on the site in 60 caravans. Now the Supreme Court has rejected pleas for the travellers’ to be allowed the right of appeal under a ‘point of law of general public importance’.